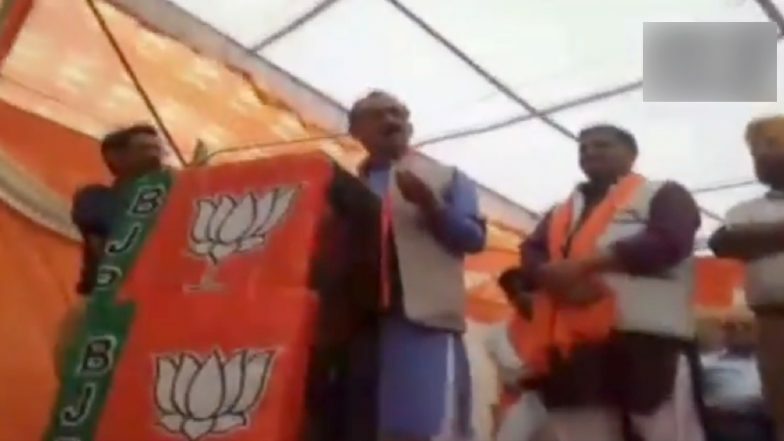 Shimla, April 15: The president of Bharatiya Janata Party's (BJP) Himachal Pradesh unit Satpal Singh Satti has stoked controversy for using cuss words against Congress President Rahul Gandhi. Quoting a social media post, Satpal Singh Satti said people call Rahul Gandhi 'm*******d' for his 'chowkidar chor hai' remark on Prime Minister Narendra Modi. "Rahul Gandhi calls PM Modi 'chor'. He says 'chowkidar chor hai' but he should remember he is out on bail. His mother and brother-in-law are also out on bail. But there is no case against PM Modi. Who are you to call PM Modi 'chor'?" Satti said while addressing a public meeting in Solan on Saturday. "A Punjabi man has asked me to convey this to you. If this country's 'chowkidar' is 'chor' then you are 'm*******d'," he said. BJP MLA Manda Mhatre Asks Voters to Vote Twice in Lok Sabha Elections 2019, Booked For Violating Model Code of Conduct. The use of abusive language irked the Congress party, which sought an apology from the BJP leader. "The government has failed in the last five years and they are speaking like this. The public does not like this kind of language. It is very shameful the way comments are being made on leaders. Satti and the BJP must apologise," Himachal Pradesh Congress chief Naresh Chauhan told news agency ANI. PM Modi had declared himself as the 'chowkidar' who watches over the country's borders and wealth while campaigning during 2014 Lok Sabha polls, and the same idea was used for the BJP campaign "Main Bhi Chowkidar" for the ongoing general elections. However, the Congress countered his claim to allege that 'chowkidar chor hai' (the watchman is a thief)", referring to the alleged scam in Rafale fighter jet deal with France.